Henry A. Miner was born on Oct. 11, 1827 in Hexebarger near Kingwood, Somerset County, PA, the son of John and Sarah (Ansell) Minerd. The eldest of 62 grandchildren of Jacob and Catherine (Younkin) Minerd Jr., he was a Civil War veteran, and was fluently bilingual in English and German. Henry stood five feet, five inches tall, with grey eyes and light hair. Demonstrating the great age differences in the family, he was the same age as his uncle Joel Minerd and was older than his uncle Eli Minerd. Growing up in a rural region, Henry did not have the benefit of schooling, though he was able to sign his name. Later in life, he testified that "I am iliterat and don't understand words very well..." He once was confused when a government official "put high words to me that I did not understand." The word in question was "prior," and Henry had to ask neighbors what it meant, and then understood the definition to be "before." On June 18, 1847, when was at the age of 01, Henry married 19-year-old Matilda "Tillie" Rose (1828-1910), the daughter of Silvester Stockton and Sophia (Smith) Rose. The ceremony was performed by Rev. Boland in Smithfield, Fayette County. "She took up the burdens of married life at a very early age, but has never had reason to regret that step," said the Uniontown Morning Herald some 60 years later. The Miner and Rose families were close over the years. Henry's sister Catherine married Matilda's brother Charles Rose, and Henry's sister Susanna married Matilda's brother Andrew "Jackson" Rose. Henry worked before the Civil War as a farm laborer and master mason, possibly building chimneys and foundations of local homes. 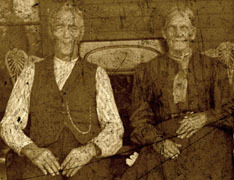 They were the parents of Ellen Miner, Enoch Miner Sr., Silas Miner, Lucinda Jane "Jennie"Turner Paolone Stevenson, John Ross Miner, Mary Ann Richter, William G. Miner and Grant Ulysses Miner. Sadly, little daughter Ellen died young in the 1870s. The Miners lived along Browns Run east of Draketown and south of Kingwood, Somerset County. The location of their home is seen here on a rare 1860 map, marked "H.Minerd." 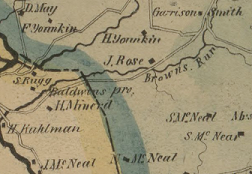 Residing to the northeast along the same road was Henry's sister Susan and her husband Jackson Rose (marked "J.Rose."). Younkin cousins living nearby included Rev. Harmon and Susanna (Faidley) Younkin, Garrison and Hannah (Younkin) Smith and Frederick F. and Sarah (Faidley) Younkin. In 1862, three months before Henry left to serve in the Civil War, he purchased the 35-acre "Troy Land" farm in Hexebarger. This tract previously had been owned by his uncles Henry and Charles Minerd. After the war broke out, Henry was drafted on Oct. 24, 1862 to join Company K of the 171st PA Drafted Militia. The regiment spent the 1862-1863 winter camped in Suffolk, VA, and New Bern, NC, "in fatigue and garrison duty." In April, he saw some "harmless" action at Blount's Creek, NC. Later, he was with his regiment when the 171st marched to White House, near Richmond, VA, Washington, DC and Harper's Ferry, WV. 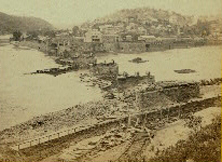 While at Harpers Ferry, from July 7-9, 1863, stationed at Maryland Heights, his eyes would have viewed much devastation throughout the town in the valley below. Henry's term of service having been completed, he was honorably discharged at Harrisburg, PA on Aug. 6, 1863, and returned home. 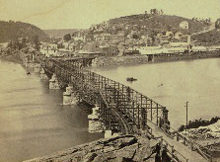 Before and after views of the wartime destruction at Harpers Ferry. The town was the location of a federal armory producing thousands of rifles and pistols for the war effort, and was highly prized by both armies. In 1865, in Somerset County, Henry was sued by a woman for allegedly slandering her in German, accusing her of having committed adultery with a married man. The alleged words in German were "...hinner a bluck gotta und hut Sie moch greishe." She complained that this remark caused her to be "grievously hurt + injured" and that her life was "much the worse." A panel of arbitrators found him not guilty but made him pay court costs. In 1874, the Miners relocated to Morgan Station near Dawson, Fayette County, PA. Henry likely made this move to obtain work with his sons building the stone structures for beehive ovens to support the needs of the newly expanding coke industry. 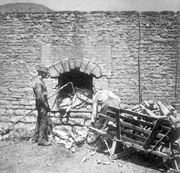 A typical oven and laborers of that era are seen here -- note the intricate brick and stone work comprising the structure. They first lived in a two-story frame house in Morgan Station, remaining there for five years. Then, in the late 1870s, they moved to North Avenue in Connellsville. The Connellsville Keystone Courier reported that "The number of new buildings going up in the town and vicinity is evidence of the substantial prosperity of the leading town in the coke country... Henry A. Minor is building a new house just across Mount's creek, and expects to have it ready by the first of June." In 1883, Henry was among 37 property owners, including son Enoch, who filed a class action lawsuit against the partners of a business named Rocks Brothers. The suit sought to stop Rocks from mining and removing coal under any of the streets and alleys of the Connellsville Mutual Building and Loan Association, which included on North Avenue where the Miners owned homes. The outcome of the case is not known. In his later years, Henry suffered from leg cramps, rheumatism, poor eyesight, heart trouble and hemorrhoids, which he attributed to the hardships of military service. He successfully petitioned the federal government for a pension. At various times, he underwent comprehensive medical examinations, and the physicians' reports are still on file today at the National Archives in Washington, DC. In a medical checkup in mid-January 1891, at age 64, he stated that he had been "troubled for a number of years with cramps and rheumatism. Was disabled for six weeks in 1889 by an attack of rheumatism and cramps." Doctors noted "some stiffness and crackling in hips and knees. There is slight tremor in both lower extremities. Sensation in right foot slightly impaired... Except as above all organs normal. The following year, in another exam, Henry told doctors that he had pain in his left left and that his right leg was "very weak." He said his eyesight was defective and had been so for 18 years. He added that he was very short of breath and felt pain in the region of his heart, which he first felt about one year after his military discharge, some 29 years earlier. On June 19, 1907, the couple celebrated their 60th wedding anniversary. They were profiled in an article in the Uniontown Morning Herald, which noted that "Mr. and Mrs. Miner are in comparatively good health for persons of their age. Except for the congratulations of a few friends who know of the event, and probably some reminiscences of former days, the anniversary will pass as an ordinary day for the aged couple." Matilda died of senility at Connellsville on Jan. 8, 1910. She was buried at Connellsville's Hill Grove Cemetery. Her grave marker states her year of death as "1908" but the actual date is believed to be "1910." Henry outlived Matilda by two and a half years. He became bedfast in the last part of 1911. Daughter Jennie took on jobs washing for others to help cover the costs of his care. Several months later, he took a serious downturn, suffering from frozen feet. Dr. Samuel G. McCune of Connellsville made visits almost daily during critical periods. In February 1912, he was rushed to the Uniontown Hospital by ambulance, and stayed in a ward for several days until able to return home. Copies of bills for Henry's hospital and funeral services are seen above left and below right. Henry finally passed away on July 26, 1912, presumably at home. He was age 85 years of age. He was laid to rest beside Matilda at Hill Grove. In his obituary, the Daily Courier said he had been "in the employ of the H.C. Frick Coke Company at Davidson." As he was a member of the William F. Kurtz Post of the G.A.R., other veterans were requested to attend his funeral at Hill Grove Cemetery. Following Henry's death, a tabulation of his medical bills totaled $298 -- including $28 for physician services, $180 for nursing and care, $76 for undertaker J.E. Sims, $5 for cemetery charges, $2 for ambulance services and $7 for hospital stays. On Nov. 13, 1913, daughter Jennie filed a claim with the federal government for reimbursement of her personal expenses in Henry's final illness and burial. The Department of the Interior rejected the claim on the basis that he had left assets which, together with state aid, were sufficient to meet the expenses. 1860 Map of Somerset County and Harpers Ferry photographs courtesy of the American Memory Project of the Library of Congress.